No matter what the season, there&apos;s always a reason to be out and about in Madison, Wisconsin. Read on for activities and itinerary ideas that are rooted in fresh-air fun. Brittingham Boats, Wingra Boats and Marshall Boats all offer rentals, including paddle boards, single and double kayaks, canoes and rowboats. If you&apos;re angling to learn the best fishing in Madison, hop aboard a Madison Fishing Charters boat and get insider information from Captain Joe Okada. Get a bird&apos;s-eye view of Lake Mendota via Biplane Rides of America, which takes off from Morey Airport in Middleton, or take a scenic flight over Madison with Wisconsin Aviation. For a tour on solid ground, bring your bike (or rent one from one of the many Madison BCycle locations) and explore Madison&apos;s 200 miles of scenic trails. The Capital City Trail offers more than 17 miles of beautiful scenery and you can also cycle the course that IRONMAN competitors use each September. These routes and more can be found on our Biking Around Madison itinerary. You&apos;ll want to catch Concerts on the Square with the Wisconsin Chamber Orchestra, one of Madison&apos;s largest and most celebrated outdoor concerts that draws more than 120,000 people annually. The series is held on the Capitol Lawn each summer for six consecutive Wednesdays, beginning at 7:00 p.m. Jazz at Five provides exceptional free concerts in a stunning locale: the 100 block of State Street, where it meets the Capitol Square. On the opposite side of the square, there&apos;s Live on King Street, a free, Friday-night outdoor concert series. The Orpheum Theater on State Street also presents a wide range of entertainment throughout the year. Monona Terrace offers its own concerts and dance events in summer, with great food from Lake Vista Cafe and views of Lake Monona. On Lake Mendota, there&apos;s the famous Memorial Union Terrace, where you can enjoy special brews found exclusively at the Union and catch up with friends as another great band performs on the outdoor stage. When the sun is shining and the music is flowing, there is no better place to be than in Madison! State Street is a bustling pedestrian mall that links the State Capitol to UW-Madison and features restaurants, retail stores and so much more! 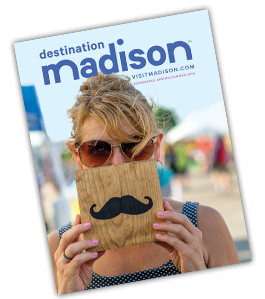 Set your sights on only-in-Madison shops such as Little Luxuries, featuring specialty gifts and accessories, and The Soap Opera, home to natural and luxury bath and body products. Or, step into A Room of One&apos;s Own if a local, indie bookstore is your preference. For artistic gifts, the Museum Store at the Madison Museum of Contemporary Art and the gift shop at the Wisconsin Historical Museum both have books, apparel, jewelry and more "made in Wisconsin" items. If all of that shopping makes you hungry, there are plenty of places to stop along State Street! Try Tutto Pasta, a family restaurant serving a wide variety of authentic, delicious Italian dishes and Fresco Rooftop Restaurant and Lounge, located on the rooftop of the Madison Museum of Contemporary Art. For dessert, step into the Chocolate Shoppe Ice Cream Co. and savor more than 40 Madison-made, super-premium flavors. Explore the outdoors at no- or low-cost attractions including the Henry Vilas Zoo, home to more than 800 animals, or visit one of the 260 City of Madison Parks that offer lakes, pools, paths and sports of all sorts. Stroll through Olbrich Botanical Gardens to take in acre after acre of stunning display gardens, or try the 20 miles of trails that are part of the UW-Madison Arboretum and home to prairies, woodlands and wetlands. Finish out your day at a Madison Mallards minor league baseball game. This league is dedicated to developing young collegiate players from strong baseball colleges around the country, and every game promises fun fan participation activities, from the "Duck Pond" to between-inning contests and more!